A-HOTEL.com - Luxury and cheap accommodation in Bol'shiye Derbyshki, Russia. Prices and hotel, apartment booking in Bol'shiye Derbyshki and surrounding. This indicative offer was derived from the most recently booked accommodation in Bol'shiye Derbyshki and sort by the price, from cheapest Bol'shiye Derbyshki accommodation to the most expensive hotels. To select accommodation by your preferences we recommend to choose from 1 accommodation offers in Bol'shiye Derbyshki in total. By entering the dates of your overnight stay in Bol'shiye Derbyshki and using the filter tools you can sort the best possible accommodation for you. The entered dates of your stay are crucial for the most accurate offer as it derives all the online information on pricing and availability of Bol'shiye Derbyshki accommodation. Then you can book the selected Bol'shiye Derbyshki lodging (hotels, apartments etc.) immediately. Guest House Aynur is offering accommodation in Bol'shiye Derbyshki. A sauna is available for guests. Located on the M-7 motorway, 20 km from Kazan city centre, this hotel features free Wi-Fi and a sauna. It also offers a tennis court and rooms with a flat-screen TV. House on Novaya 1, featuring a garden, is set in Kazan, 14 km from Riviera Aqua Park and 15 km from Soyembika Tower. The lodge is 15 km from Holy Dormition Convent on Zilant Hill. Viktoriya Hotel is situated in Kazan, 11 km from Kazan Kremlin and 11 km from Soyembika Tower. Guests can enjoy the on-site restaurant. Offering various treatments, including massage, photot- and thermotherapy and mud treatments, Health Resort Krutushka is set in Kazan, a short walk from Lake Goluboye. The hotel has a children's playground, and guests can enjoy a meal at the restaurant. Situated in Kazan and within 19 km of Kazan Arena, Usadba Liesnoy Dvor has barbecue facilities, rooms, and free WiFi. The property is around 19 km from Riviera Aqua Park and 20 km from Soyembika Tower. Set 18 km from Riviera Aqua Park in Kazan, Квартира offers accommodation with a kitchen. The accommodation has free WiFi. Zhemchuzhina Motel is located in Kazan, 16 km from Kazan Arena and 19 km from Riviera Aqua Park. 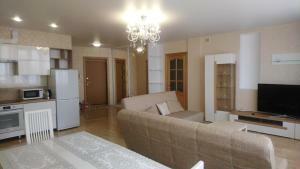 The property is set 20 km from Freedom Square, 20 km from Kazan State University and 21 km from Annunciation Cathedral. Set in Kazan within 17 km of Riviera Aqua Park and 17 km of Soyembika Tower, Ak Bars Hotel offers rooms with free WiFi. The property is situated 18 km from Holy Dormition Convent on Zilant Hill. Motel SOYUZ offers accommodation in Kazan. Free private parking is available on site. Located in Kazan within 17 km of Riviera Aqua Park and 18 km of Soyembika Tower, Zaman Hotel provides rooms with free WiFi. Offering a restaurant, the property also has a bar. Featuring a terrace, Hotel Complex Dobriy Finn offers rooms in Kazan, 18 km from Riviera Aqua Park and 18 km from Soyembika Tower. The property is located 18 km from Holy Dormition Convent on Zilant Hill and 18 km from Annunciation Cathedral. Chibis Hotel offers accommodation in Makarovka. The accommodation provides a 24-hour front desk as well as free WiFi. Apartment Adoratskogho 53 is set in Kazan, 4 km from Kazan Arena, 4.2 km from Riviera Aqua Park, and 9 km from Soyembika Tower. Situated 3.6 km from Kazan Arena in Kazan, Уютная квартира с видом на Казань Арену offers accommodation with a kitchen. Set in Kazan, 3.6 km from Kazan Arena and 5 km from Riviera Aqua Park, Apartment on Adoratskogo 42 offers air conditioning. Situated in Kazan, 3.7 km from Kazan Arena and 4. Located 7 km from the city centre of Kazan, Sigma Hostel features a sauna and free private parking. Rooms at Hostel Sigma offer towels, linens, and heating. Апартаменты на Чуйкова in Kazan offers accommodation with free WiFi, 3.5 km from Kazan Arena and 5 km from Riviera Aqua Park.